Today on the YarnThing Podcast with Marly Bird: Kimberly McAlindin, Editor in Chief at Crochet 1-2-3 and Knit 1-2-3! Listen in below to hear Marly and Kimberly talk about how Kimberly learned to knit, how she got into designing, what she is up to now, the magazines, her own podcast and much more! Kimberly learned to knit when she 9 in an after school program and actually remembers going to the store and buying size 9 Boye straight needles and Red Heart varigated yarn with her mother. She made blankets and dresses for her doll as a girl and kept knitting until high school when other things (wink) took over. Knitting has always made Kimberly feel grounded so she kept at through college. 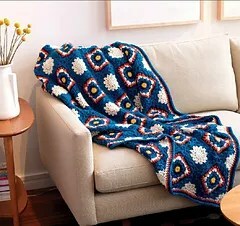 When she got married and it seemed like every one else was too, she started making afghans as wedding presents. Wedding season turned into baby season and at one shower she saw a basket absolutely full of crocheted baby things. She was so amazed, she when right out and learned to crochet and went gangbusters with crochet gifts as well. Kimberly started teaching crochet at a local yarn store when she found out their crochet teacher was leaving. She became the crochet guru at the knitting shop. Soon after her daughter was born, the shop owners offered to take her with them to TNNA to help them pick out more “crochet friendly” yarns for the shop (we all know all yarns are crochet friendly now). Harriet and Susan, she shop owners, introduced her to the owners of Tahki Stacy Charles. Stacy of Tahki Stacy Charles found out she crocheted and offered to accept submissions for their new book. Although Kimberly had never designed anything at this point, she accepted. 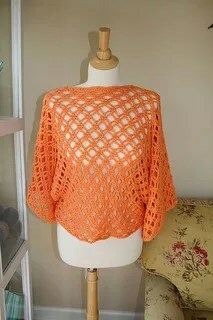 When she got home, she made designs for two tops and a belt, sent them off to Stacy, they were all accepted and were published in the first book of crochet from Tahki Stacy Charles. And that is how her design career started, by winging it. She kept going to shows and met more people in the industry which lead to more work with companies like Caron, Coates and Clark, and Crochet! magazine. A few of her designs are shown below. Kimberly is now the editor of both Knit 1-2-3 and Crochet 1-2-3 magazines. She started out as the technical expert for Knit 1-2-3. The magazines are based on the principle that 1 is beginner, 2 is novice, and 3 is intermediate and every issue has a technique article that you can learn a new technique from. This technique article has a design to go along with it for each level. So Kimberly would write the article and design a piece for each level. The original editor moved to the magazine Knit Style and Kimberly became the full editor for both magazines, since she is bicraftual. The next issue of Knit 1-2-3 is coming next week and Marly has a design in that issue. Julie here, I made the sample for the So Easy Top that Kimberly’s daughter had to steal, it is super cute and you should go find it next week ;). In addition to her editor duties, Kimberly recently started designing again after her she made her Winter Olympics sweater (which she does every Winter Olympics) and her local yarn shop wanted the pattern. You can find her patterns on her website, Hooked on Knitting, link below. And we can’t forget the Giveaway! Leave a comment below for your chance to win a 1 year subscription to Knit 1-2-3 or Crochet 1-2-3! Does Otis have some of your crochet items? Loved hearing of your breaking into the industry. Audrey… Otis does not have any of my crochet items, although he sleeps on an afghan I made years and years ago. He only sleeps on it because it is at the end of our bed! I’m glad you liked the show!! I am a huge Animal House fan! So glad that we are both lip kissers! Thanks for the great show today. Your Otis sounds like an important part of your life. Great to hear all about you on the show. Why thank you Carol… Otis is a very important part of my life. He is the bridge between taking care of small children and taking care of growing humans… I was feeling very un-needed and Otis was my answer. It’s wonderful having a companion with me all day (I mostly work from home) that doesn’t ask me to make him a grilled cheese every 5 seconds! Loved listening today. Otis is such a unique name for a dog. Loved how Kimberly referred to him as her favorite human. We have 2 in our house. When I go to Walmart I usually sneak Knit 1-2-3 into my cart. Great magazine. Did I tell you how Otis got his name? We were at our beach house sitting on the dock (which is on the bay) when my husband finally said I could get a dog (I had been using all of my womanly powers for YEARS to get this dog)… My husband said he had to be a male dog whatever we get… And Otis was named before we even saw him as we were sittin’ on the dock of the bay!! I would love for you to have one… I would love for everyone to have a subscription to Knit 1-2-3!!! Good luck! Otis is a great name for a dog. I’ve always had difficulty naming my pets. Great to hear Kimberly’s story. Thank you… hotknitter – what an awesome name!! I just knew that Otis must be the name for your dog. I was out walking Skipper while I listened. I was laughing out loud as I listened while walking down the road and through the park- just me and the dog. It’s not quite the picture of a sane person perhaps, but the part about you knitting or maybe it was crochet at the YMCA was so funny. You’ve convinced me I need to learn to crochet- I need that green sweater. Yippee Vicki… come on over to the Crochet Side!!! It’s a great addition to your knitting skills. I can totally picture you walking your dog and laughing out loud! Great show. I was cracking up over her mothering vs crafting. Otis is my spindles name. OHHH what kind of spindle?? I’ve tried spindling… but I kinda stink. What kind of dog is Otis? Have you designed any patterns for Otis? I need to learn more crochet stitches! This show was really hilarious and the bathroom YMCA story was fantastic! I raised 4 children and can totally understand how that would happen! Would love to see a pic of Otis also! I almost named my dog Otis, but Buster was name I gave him. Loved the podcast. You 2 were a hoot! I need to make a new coat for my little dog, although her name is not Otis. Otis is a perfect name for a puppy. I bet he’s super cute. This podcast had me laughing out loud! Good thing I wasn’t in an Otis elevator full of people . . . .
I’m so glad you were laughing out loud…..
Haha I love Animal House! I’m glad you enjoyed the show! Otis elevator is actually near my hometown in CT. There is this giant tower in the middle of nowhere where they test the elevators. LOL . Great show, and I’m going to try to do my first submission for Knit 1-2-3 when the call comes! That is so cool Sara… make sure you are on our call for submissions list! Right now I am deciding Issue 14 which is our Holiday Issue, the deadline is very soon for submissions…. Good Luck!! Otis sounds like a sweetie! This was such an interesting episode. I’ve already checked out the Namaste Farms podcast and set my DVR for Shear Madness. Exciting happenings in the fiber industry! Thanks, Marly, for what you share with us. Shear Madness is rocking along… I hope you are enjoying it! The last episode is tomorrow 4/5/14… Let’s keep our fingers crossed for Season 2!! What Natalie is doing for the fiber industry is gigantic! My three dogs would love to play with Otis. Interesting and fun interview. Thank you for listening Malinda I’m glad you had fun! I hope Otis doesn’t try to eat your yarn. I don’t have a dog, but I’m sure my pet rabbit would turn my stash into a disaster zone if he ever got into it. He’s pretty good at that. Amberly (awesome name, by the way) Otis does not try to eat my yarn, but Willa our English Angora Rabbit has taken a bite out of a skein or two… she in no longer allowed in the studio and I watch her very closely if I am knitting while she is hopping about the family room. I just love to watch Willa! Otis! I don’t currently have any pets but a dog would be lovely. As I sit here and read all of these wonderful comments, my Otis has his head on my feet and is snoring away! A dog is a wonderful companion. Milo and Otis was my favourite move as a child. Love the Podcast, and loved this episode! Hayeli (Ravelry) from Australia. I’m going to have to see if I can get Milo and Otis on Netflix or something like that…. I think there is a book of the same name here. Thank you for commenting! It was so funny when Kimberly mentioned Otis being her dog’s name! Otis was my husband’s nickname among his close friends. And, did you ever see the romantic comedy movie, “Kate and Leopold”? (It’s such a great movie!) In this movie, the creator of the elevator, Leopold, put the name of his closest father figure to him on the elevators — Otis! Sadly I never saw that movie… but I totally dig Hugh Jackman! I’ll have to check it out – thanks for the comment! This was a great show, really inspiring to hear your story. Kimberly’s family and dog, Otis, seem so supportive. Her story was inspiring! So glad you were inspired Abby…. I wish you well on your own fiber journey! Otis is my husbands middle name. And a handsome man he must be! Kimberly… I am so thankful for your comment! I had to call my husband at work and read it to him. He then said, wow Kimberly who wrote that and I started to read your name and laughed out loud… he joked that I wrote it myself!!! Good thing I have your photo to show him!!! Thank you thank you again from the bottom of my heart. You have made my year!